This diagram illustrates planting three varieties of one type of fruit in a single planting hole. The trees are trained and pruned as they grow together. You can select varieties with different ripening dates to spread your harvest through the summer. Photo courtesy of L.E. Cooke Co. Here's how it's actually done. You dig a wide hole, about four feet across and about 18 inches deep. Plant the trees two to three feet apart in a triangle in the hole, leaning gently away from each other. Then you prune out branches that would be crossing between the trees. Photo courtesy of L.E. Cooke Co.
Three trees in one hole, continued. Here they are in the first summer. You can continue to prune branches that cross or tangle, even during the growing season, and can top down the trees to control the size. Photo courtesy of L.E. Cooke Co.
EZPick is one company's growing technique that makes your training easier. A field worker has simply walked down the row early in the growing season and headed back the young 'whips' to induce branching. Now you can start selecting a few of those branches to remain, thinning the young tree out as it grows, and keeping the fruit within picking range. You can fit fruit trees in narrow spaces! Remember, you control the size of the tree. I took this picture at the UC Davis experimental orchards several years ago. Every flower you see can potentially become a fruit, so clearly even heavy pruning can lead to sufficient yields. 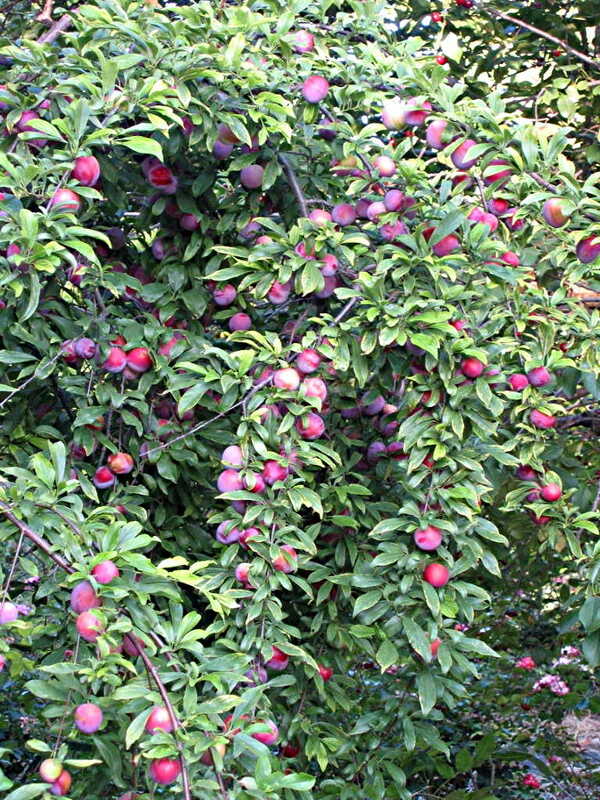 There are lots of great plums, and interesting new hybrids like the pluots (apricot-plum), pluerries (plum-cherry), and peacotum (peach-apricot-plum) are now available for home gardens. But the old Santa Rosa plum, introduced by Luther Burbank, is really a garden workhorse. Productive, with excellent flavor, it needs no pollinizer. Better still, it can pollenize most other varieties of plum as well as most pluots. 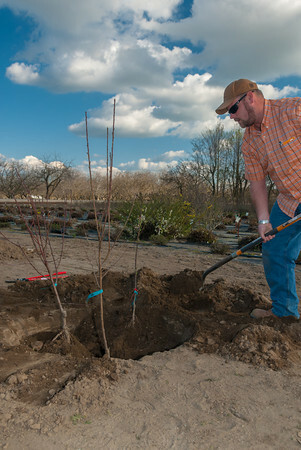 Trucks are rolling, and bare root fruit trees are coming to garden centers all over California. This is the season with greatest selection and best value. If you've thought of adding some fruit trees to your garden or landscape, January and February are great months to look for them. Which plants come bare root? Fruit: apples, apricots, berries, cherries (see note below), figs, grapes, jujubes, mulberries, nectarines, peaches, pears, persimmons, plums, pluots, pomegranates, quince. Some shade trees, flowering trees (plums, cherries, redbuds), wisteria, and flowering shrubs such as lilac are also sold bare root. We get asked: you're still not recommending cherries? No, sorry: there is no reasonable control measure for the Spotted wing drosophila which infests the fruit. What about citrus? Avocadoes? Olives? Trees that are sold 'bare root' need to have a dormant period, so it is only done with deciduous types. All of those are evergreens, and are available year-round. Subtropical fruits such as citrus and avocadoes are best planted in the warm months. Olives can be planted anytime. Do I have to buy these now? Or will they be available this spring or summer? Isn't fall a better time to plant? Fall is a great time to plant but winter is when you have greatest availability. Fruit trees: explaining the terms! We get lots of requests for "dwarf" trees to fit in small back yards. I'm getting away from terms like dwarf and semi-dwarf, but you'll still find them on nursery tags. I consider them misleading. There are some rootstocks that make a tree grow more slowly, but it still eventually gets to the same size. You still have to prune it. This is the key principle: you control the size of the tree by training and pruning. Size is controlled by pruning, not rootstock. 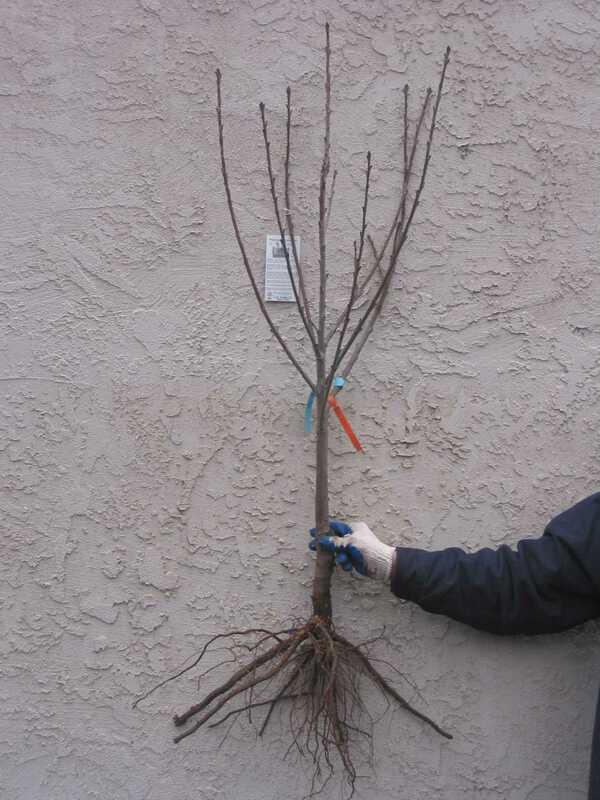 * Standard rootstock: plant grows fast, three to five feet a year. * Semi-dwarf: plant grows slower, two to three feet a year. * EZ Pick: plant on standard or semi-dwarf rootstock has been headed back when young (by the grower) so that it branches low. Miniature trees (also called genetic dwarf) are novelties. They're natural mutations of peaches and nectarines that result in a very compact, shrub-like tree. Fun for really small yards; fruit quality is ok, but not as good as regular varieties. "Needs pollenizer" means the tree needs another variety of the same type of fruit. ("Pollenizer" is the other variety of tree, "pollinator" is the bee that does the work). It's not male or female (in most cases), it's that some varieties are self-sterile. So, for example, you need two different kinds of plums in order to get fruit, and in some cases very specific ones. Check the label, or ask. This can be a confusing topic, because some varieties listed as needing pollenizers will actually set fruit without one: most apples and pears, for example. 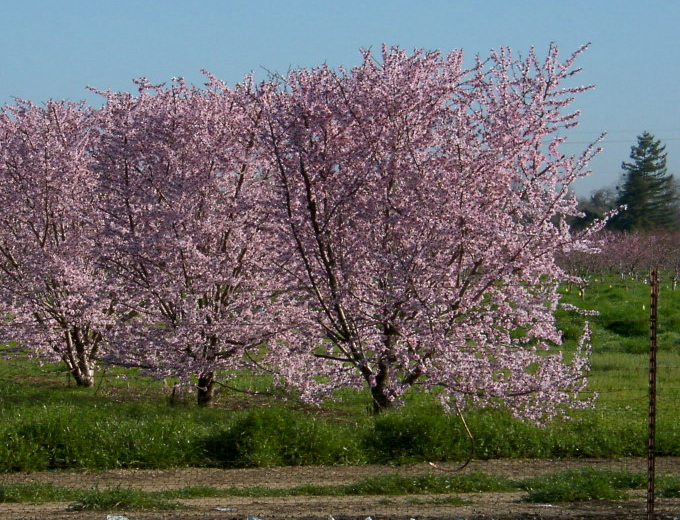 Commercial growers add pollenizer trees to increase or guarantee yield. Others definitely need pollenizers: pluots, some self-sterile apples, many cherries, and most Japanese plums. European plums don't. Santa Rosa plum is an excellent pollenizer for most other plums and for most pluots, and has great fruit as well. If you're buying one of the new interspecific fruits such as a nectar-plum, pluerry or peacotum, check for the specific pollenizer that it needs. Apricots, figs, grapes, mulberries, most nectarines, most peaches, most persimmons, pomegranates, and quince never need pollenizers. "Chilling hours" refers to the number of hours between 32 and 45 degrees that the variety needs in order to break dormancy and flower and set fruit properly. We get 800 to 900 chilling hours here. Lack of chilling hours is an issue in the Bay Area and Southern California, where they get far fewer chilling hours and have to grow "low-chill" varieties. People keep asking me if we should be concerned about the chilling hours declining due to climate change. How should I plant and care for my bare root tree? -- We don't prune new trees when we plant them, except to remove broken branches and do some trimming for shape. But it is ok to cut the tree back if you wish to begin the low-branch training process now. Your choice. -- Dig a hole wide enough to fit the whole root system without bending or cutting the roots. You do not need to dig any deeper than the root system. Typically this means a hole 2 to 3 feet wide, by 18 inches deep. You may need to water first! -- Center the tree in the hole, with the graft facing to the southwest (to shade the graft scar). -- Spread out the roots, backfill with the native soil, firm it down. It is ok to add organic fertilizer to the backfill, but compost is not needed. -- Make a basin by mounding up a ring of excess soil. -- Water thoroughly: fill the basin, let the water run for a while to really soak the soil well. If the tree settles, tug up on it. -- You may need to stake the tree, but only to anchor it. A fruit tree usually doesn't need a full double-stake system as a shade tree would. Be sure to remove that small anchor stake by mid-summer. -- Paint the trunk and lower part of the tree with interior white latex paint to prevent sunburn. Or install a tree trunk guard. Sunburn, leading to borers, is a common cause of failure of young fruit trees. In a winter with average rainfall: water once very thoroughly at the time of planting. Water again about once a week unless it rains, giving the tree 4 to 5 gallons of water, until the tree begins to grow. In a dry winter (this was our standard advice during the 2010 - 2015 drought): give the tree one gallon of water every day, at least until the tree buds out and begins to grow. If you use a drip system, you probably should have at least two emitters over the root zone for adequate distribution of water. -- Be sure to soak the whole area around the tree every week or so as the watering season begins. The roots need moisture as they emerge, and as they grow into the surrounding soil. -- Mulch conserves moisture. Spread it out any time, but take care that it is not piled up against the trunk. 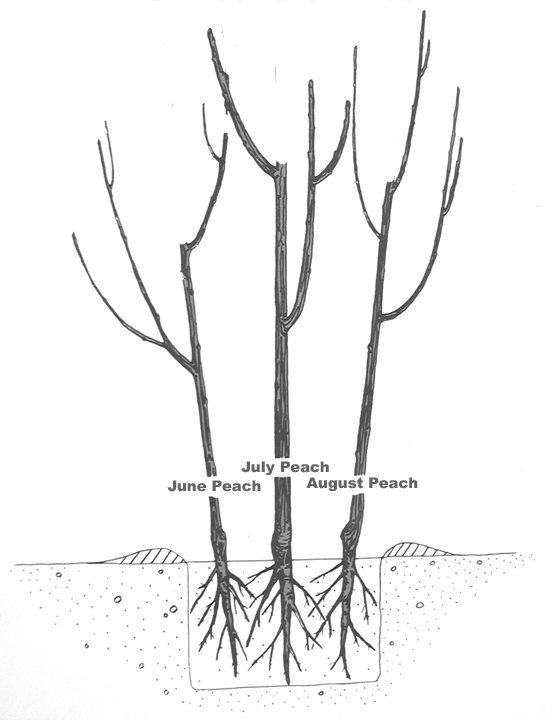 An exception about root systems and hole size: walnuts and pecans are tap-rooted trees. Hole needs to be two to three feet deep. Espaliering is training a tree flat against a fence or wall. It is simplest with types that have limber wood to bend and tie against the wall, such as apples and pears, but nearly any fruit species can be trained in a two-dimensional hedge-like shape to produce fruit in a narrow yard. Three in one hole, or high density planting. This is a simple and manageable way to get lots of fruit types into a small yard. Plant very close together, prune in summer for size control, and in winter to train the trees apart from each other. You can plant as close a few feet apart, or even plant three trees together in one large hole. With this technique you can have fruit ripening in different months all summer. Summer pruning . You can prune your fruit trees for size control after they finish fruiting. It's not complicated: you're just cutting off a fair bit of the new growth to keep the trees lower. Major structural pruning is still generally done in winter. 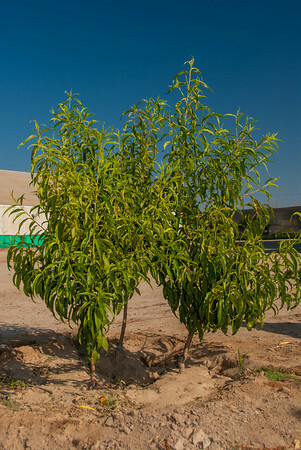 It often amazes newcomers to the Valley how many types of fruit trees we can grow. It is possible, with planning, to have fruit from your backyard every month of the year. Most fruit trees are very drought tolerant once established and can be readily added to an existing landscape. Plant now for summer bounty!